Please review the announcements below then have fun browsing the site and connecting with old friends. 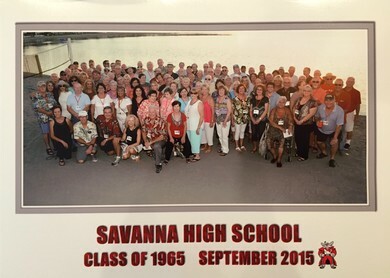 The Class of ’65 Legacy Fund is alive and well! The latest recipient of the Class of ’65’s Legacy Fund now has “happy feet”. Thanks to your generosity, the Savanna Senior is now sporting a new pair of very much needed cross country shoes. He is a highly active senior who has participated in band and cross country for four years now. Our Legacy fund provides necessary funds and gear that allows current students the ability to participate in extracurricular activities. Any amount that you are able to donate is much appreciated and can make a positive impact in a students life. Lisa Cruz the Senior Administrative Assistant at Savanna High School is once again able to receive donations directly. Put your bifocals on and look for yourself! We want to recognize and thank the many class members who have generously donated to support your 50 Year Reunion Events and the Class of 1965 Legacy Gift. Click Here if you wish to donate.